“Camera. Reinvented.” claims the website for Lily, the latest consumer drone to capture people’s attention. 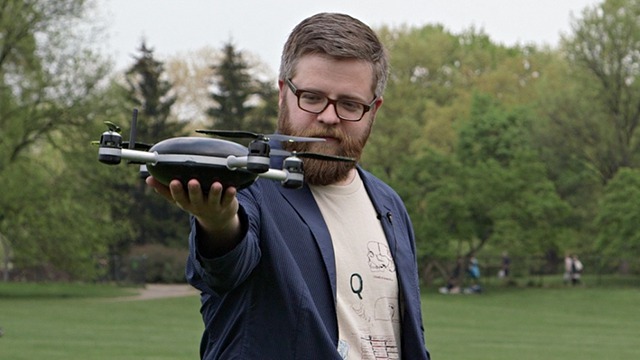 Although “selfie drone” seems to be a more popular phrase among the media covering its launch. Yes, in 2015 we have drones to take selfies for us, because maintaining the perfect duckface while tapping a touchscreen button are sorely testing humanity’s multi-tasking capabilities. Actually, that’s a little unfair on Lily, which is an interesting spin on the drone formula. Its schtick is that owners will be able to throw it in the air then go about their business, while the device follows them shooting high-definition video and photographs. Sadly (for potentially-amused bystanders) this doesn’t involve sprinting along the road in terror as a whirring hunk of metal zips towards your head like a modern, budget remake of North by Northwest. Instead, Lily is pitched at skiers and snowboarders, athletes and other active types: a hovering alternative to strapping a GoPro camera to their helmets, with the benefit of shooting footage of them, rather than just a first-person viewpoint. Lily can shoot 1080p HD video at 60 frames-per-second or 720p video at 120 frames-per-second for slow-motion action, as well as 12-megapixel still photographs. It takes two hours to charge and can then stay in the air for 20 minutes before needing to be plugged in again. The device will fly a maximum of 15m and a minimum of 1.75m above its owner’s head, to avoid accidents, with an average speed of 15 miles per hour. Those owners will wear a tracking device to ensure that Lily follows them, with the device hovering in place and trying to recover the signal if it loses the wearer, before landing “smoothly” – an action also taken if it runs out of battery. Lily’s manufacturer has opened pre-orders for the device at 9 (£319), with buyers charged immediately rather than when it ships, which the company says “helps us reduce risk”. The price will rise to 9 (£638) once it goes on sale. The company was founded by a group of graduates from Berkeley University in California who’d been tinkering with robots. “Our passion for personal robotics led us to believe that there is a better way to capture and share the world around us,” explained chief executive Antoine Balaresque on Medium. The company does not expect Lily to spark privacy arguments. “Lily is always pointing at you and less than 100ft from you. Also, Lily’s motors make noise,” explains its FAQ, in response to a question about spying on neighbours.